The ninth carp in our gallery of Legendary Carp Paintings is the largest carp ever to swim in UK waters. Our current British Record was pursued by many yet only caught by a comparative few. Its home, One of the first documented captures from Conningbrook was by Paul Forward ,who caught Two Tone as she was eventually named at a very modest thirty pounder, but she soon attained much heavier weights as was destined to become a UK record. 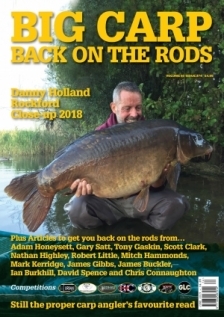 Anglers such as Terry Hearn, Jim Shelly, Dave Lane and Lee Jackson are amongst those who held Kents biggest prize. In fact the British Record changed hands several times as she steadily grew beyond the incredible 60lb barrier until in 2008 Oz Holness claimed the record at 67lb 8oz, a record that stands today. Sadly she has now passed but is recaptured here in this incredible painting in all her glory speeding off through the depths. As with the others only 100 signed and numbered prints are available.